The first step in traditional goal-setting is to carefully identify what we want. This is easier said than done. Ironically, most of us know what we do NOT want, yet we struggle to articulate what it is that we DO want. We say we want to be debt-free because we find it stressful to have inadequate financial means. We say we want a new relationship because the one we have is unhealthy. We say we want a new job because the one we have is unfulfilling. We say we want to be pain-free because we suffer from a degenerative disease. Undoing our undesirable circumstances, or symptoms, will not satisfy us for long, because neutralizing a negative brings us only to net zero (-1 +1 = 0). Regardless, becoming debt-free (having 0 debt) is one of the most commonly stated goals. Neutral goals keep our attention on that from which we wish to escape, rather than on the outcome we wish to attain. Because our attention fosters our reality, it is incumbent upon us to focus our attention on our desired outcome and on performing those actions required to achieve it. 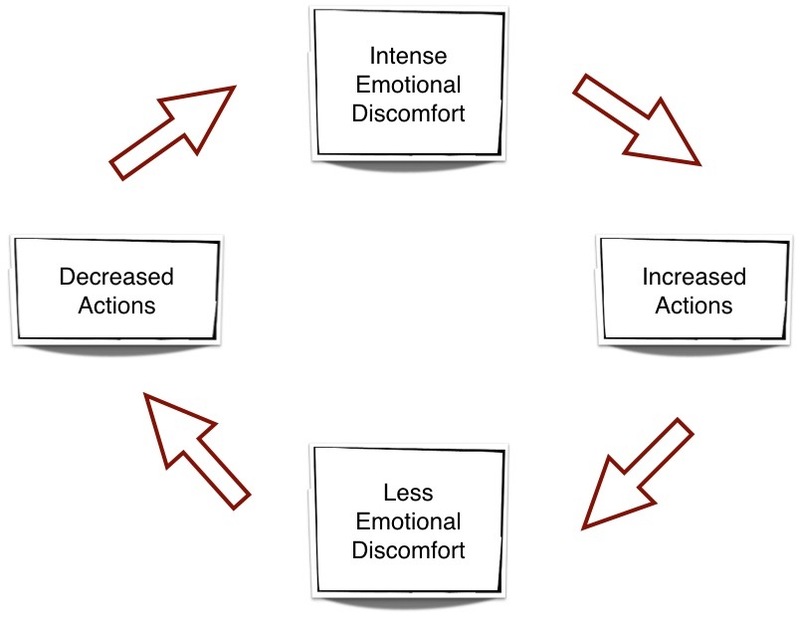 Because a neutral goal is about eliminating something painful, any progress toward that goal diminishes discomfort and, as a consequence, actually decreases motivation. Below is a flow-chart showing the cycle of yo-yo goal-setting, and on-again-off-again motivation. When we set a neutral goal, we begin at the top of the loop with intense discomfort and great determination. While in this condition we eagerly commence remedial actions. After happily achieving some measure of success we notice our pain has lessened. As we continue feeling better, our efforts seem to have diminishing returns. With waning motivation obstacles grow firm and flagrant, and temptations abound. The cascading enticements of immediate gratification challenge any lingering commitment to the goal. If we have not fallen into this catch 22 ourselves, we likely know someone who has. The cycle usually ends with us in pain again. Having had such an experience, we may adopt the opinion that goal-setting simply does not work, a position that forgives us for our own shortcomings. Some of us may instead see ourselves as flawed and incorrigibly undisciplined. Taking this position closes the door on future possibilities, which we expect to merely mete out punishment to those of us who dare try to climb out of our discontentment. To avoid additional doses of frustration and discouragement, we promise ourselves to be wary of ever again getting suckered into believing we can have a life our own choosing. Whether we turn the blame outward or inward, whenever we play the blame game we find ourselves disempowered. Becoming debt-free is a popular aspiration. Let us consider the question, What is the point of being debt-free? If the point is merely to get the creditors off our back, then our goal has the neutral ambition of negating a negative. In such a case we will likely encounter the same two problems of neutral goals that were enumerated above the graphic in the previous section. Maybe our purpose of going from having debt to not having debt is to improve our financial status. Getting out of the hole is definitely an improvement, however, we will not feel secure for long in the neutral zone of being dead-even. A neutral goal of zero debt becomes a positive goal when we target a specific amount of money adequate to cancel all debts, provide for emergencies and cover future needs like the kids’ college tuitions, home repairs, unforseen travel expenses, etc. Even as we wisely plan for future needs, we are still feeling a little flat. What we really want is financial security and the freedoms it provides. How much money will it take to be financially free? With this question we recognize that just as money comes, it may also go: investment values rise and fall; prices rise and fall; in fact, the value of a dollar rises and falls. To have general security it is unwise to put all our eggs in the basket labeled “financial”. To add more depth and breadth to an exclusively money-based goal, we may wish to participate in a community garden, time bank or barter club. If a person has a goal of losing weight, targeting a number on a scale is another example of a neutral goal. (Losing our excess weight is negating a negative.) To expand the scope of this goal, we can ask ourselves, how will I feel and look when I am at my ideal weight? What kinds of things will I be able to enjoy doing when I am healthier and more energetic? The answers to these questions bring an emotional relevance to the goal. The expanded goal of being healthier and happier is now supported by secondary goals, which include having an appropriate body-mass-index, a healthy relationship with food, effective stress-relieving strategies and getting adequate exercise. Now, let us revisit the financial goal and ask ourselves, When I achieve financial solvency how will my life improve? Perhaps we believe we will feel more relaxed, more confident in our capacity to provide comforts for ourselves and our dependents, whatever may come in the future. Perhaps we envision ourselves effortlessly riding the tides of uncertainty that threaten to rock our proverbial boats in the not-so-distant future. Expanding our dollar-oriented goal into a goal of general security, we unveil secondary goals which directly pertain to our primary goal. The added emotional relevance accelerates our overall motivation. The secondary goals may include connecting with mentors to develop skills and knowledge of sustainability practices, forming teams of support-mates who engage in community resource sharing, and acquiring diverse, essential resources (only one of which is money). We then break down the secondary goals into tertiary goals, and sometimes even further. The hierarchy continues until we arrive at specific actionable steps which can be put on a calendar. We will address actionable steps later on in the main body of the chapter to which this aside is attached. For now, we wrap up this section with a couple of added bonuses for converting neutral goals to positive goals. First bonus: achieving a positive goal has compounding benefits. In banking, compound interest benefits those with savings and, conversely, penalizes those with debt. This quote not only reflects the way bankers and power-brokers work; this scripture admonishes us all to set positive goals. To one who has (positive goals) more will be added, (his/her benefits shall compound). To one who has not (neutral goals produce a net-zero result), he/she shall lose even more (although efforts are are exerted, our pain is greater at the conclusion of the cycle than at its commencement). The gains attained from achieving positive goals are translatable to other areas of our lives. Our future capacities compound upon the foundation built by our previous achievements. Second bonus: we are empowered by taking steadfast actions toward positive goals. With each advance we become increasingly optimistic and encouraged. Having positive goals, which evoke powerful fantasies of newfound freedoms, whets our appetite, whether for personal extravagance or for altruistically contributing to our world-wide community. A newfound confidence in our approaching success opens our receptivity. Positive expectations and purposeful actions also work to disintegrate obstacles. We have the sense of being ‘green-lighted’ at every turn. With our finish line in sight, we palpably feel its pull.